VANCOUVER , April 26, 2018 /CNW/ - IsoEnergy Ltd. ("IsoEnergy" or the "Company") (TSXV: ISO; OTCQX: ISENF) is pleased to report analytical geochemistry results from samples collected from drill holes GG18-08 and GG18-09 during a recently completed core drilling program at its 100% owned Geiger property (the "Property") in the Eastern Athabasca Basin region of Saskatchewan. Highlights include a sample containing 0.35% U3O8 over 0.2 metres in drill hole GG18-08, within a larger 2.0 metre interval (above a cutoff of 100 ppm U3O8) that averages 0.11% U3O8 from 271.2 to 273.2 metres. Additionally, drill hole GG18-09 returned a 15.0 metre interval (also above a cutoff of 100 ppm U3O8) that averages 0.03% U3O8 from 207.0 to 222.0 metres. Both drill holes also intersected elevated uranium pathfinder elements. 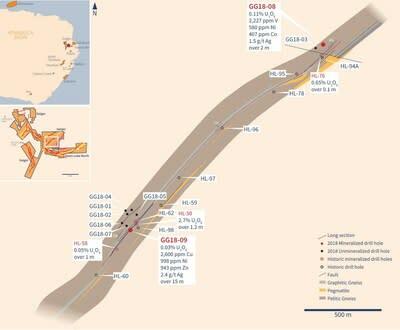 Designed to evaluate extensions of basement hosted mineralization in historic drill hole HL-76 (0.65% U3O8 over 0.1 metre), drill hole GG18-08 was completed as a 50 metre step-out along-strike to the northeast (see the IsoEnergy news release dated March 5, 2018 ). It intersected 2.0 metres (271.2-273.2 metres) of 0.11% U3O8, 2,227 ppm V, 580 ppm Ni, 407 ppm Co, and 1.5 g/t Ag. The interval includes 0.2 metres (271.2-271.4 metres) of 0.35% U3O8, 9,320 ppm V, 2,060 ppm Ni, 1,560 ppm Co, and 5.9 g/t Ag. Uranium mineralization in drill hole GG18-08, like that in drill hole HL-76, is basement hosted. The sub- Athabasca unconformity was intersected at 256.3 metres. The intersection in GG18-08 is open in several directions, including down-dip, up-dip to the unconformity, and along-strike to the northwest. A separate zone of high grade base metal mineralization was also intersected in the basement, consisting of 0.7 metres (400.1-400.8 metres) of 5.14% Zn, 0.10% Pb and 2.0 g/t Ag. It is unclear whether the base metal interval is related to the uranium mineralizing event. Drill hole GG18-09 was designed to evaluate extensions of basement hosted uranium mineralization in historic drill hole HL-50 (2.7% U3O8 over 1.2 metres), located approximately 1.7 kilometres southwest of GG18-08. The uranium mineralized interval in drill hole GG18-09 is much thicker than GG18-08 and straddles the sub- Athabasca unconformity. Within the 19.3 metre interval of elevated radioactivity reported previously (see the IsoEnergy news release dated March 13, 2018 ), a 15.0 metre interval (207.0 to 222.0 metres) averages 0.03% U3O8, 2,600 ppm Cu, 998 ppm Ni, 943 ppm Zn and 2.4 g/t Ag. This broad interval includes individual samples with up to 14,700 ppm Cu, 3,130 ppm Ni, 407 ppm Co, 3,670 ppm Zn and 6.4 g/t Ag. A second, narrower zone of uranium mineralization was intersected deeper in the basement. It consists of a 0.7 metre interval that averages 0.02% U3O8 and 795 ppm Cu from 251.8-252.5 metres. The closest drill hole along-strike to the southwest is located 150 metres away and likely missed the target horizon given the reported basement geology. Therefore, the mineralized zones are open along-strike to the southwest. A summer core drilling program to follow up on the results in drill holes GG18-08 and GG18-09 is being planned. Drilling will likely begin in June and will consist of 8-10 holes targeting both areas. Steve Blower , Vice President of Exploration commented: "The geochemical results from both drill holes GG18-08 and GG18-09 are encouraging, and further support our view that the Geiger property remains highly prospective for the discovery of economic uranium deposits. I'm particularly encouraged by the robustness of the intersections and the open nature of the mineralization. Our technical team that includes Senior Geologist Andy Carmichael and Geologist Justin Rodko, has done a terrific job of identifying and prioritizing drill targets at Geiger and has delivered outstanding follow-up results." Craig Parry , Chief Executive Officer commented: "I'm pleased to see our strategy of building on our portfolio of exploration properties in the highly prospective eastern Athabasca Basin is yielding exciting exploration results. The recent closing of our fund raising puts us in an excellent position to follow up these results with a summer drill program and we look forward to reporting on this work when it commences."